Even if your relation with Metal is casual you cannot deny the influence of HELLHAMMER. And more specifically, if you like the most extreme and obscure areas again the Swiss band is more than a 'must'. Now, if you don’t like them or you believe that their sound is weak or childish you can leave this review or better this site and consecrate on some ANGRA recordings that will fit better to your ears. Now, to the point: for some people HELLHAMMER is not just a band. It is something much more. The genesis of Death Metal, the sound of the tomb, the death’s caress and total metallic madness. Anyway this is not for now. There are some bands that not only have been deeply influenced by that horde but made a purpose of reaching as much as it could be the sound and this cemetery and deadly feeling of HELLHAMMER. Some of them made it good, some others not so and these Germans can be easily recognized as something like the most characteristic group that done it in the best way. They started in the mid of the 90s and everything, from the guitars till the vocals, are moving exactly the way of these old hunting recordings that influenced them so. The four albums that they have unleashed have been worshiped by a lot of people and their ending came in the end of 2001 when their last album “Curse Of The Absolute Eclipse” was recorded. 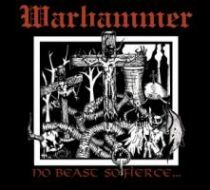 WARHAMMER reformed five years later although one of the very basic members and song writers, guitarist Frank Krynojewski, or else characteristically named “Necros II”, was not in the newline up. That put - at least to me - many thoughts in mind whether they would continue in the same music style they offered us. To my surprise not only they have returned strong but in some moments of this new album they are deadlier that ever. “No Beast So Fierce …” was out in CD format in the previous year and there is also a tape (argh!!!!) version. What we present here is the vinyl version from High Roller Records that also includes a bonus 7” that has three covers; “The Return Of Darkness And Evil” from BATHORY, “Poison” from VENOM and the most spicy one “Sphinx” from the Germans POISON. The album itself now continues the HELLHAMMER hailing and trust me they are one of the best when they are doing it. The intro has some bombs and bullets coming together with a pure necro riff and then songs like “Doomsday Inferno”, “Warriors Of The Cross” and the ghoulish opening of “The Bloodstained Shadow” sounds as morbid as it should. The highlights among others are the speed holocaust, like a storm attaching you, “Flames Of Armageddon” or the ultimate hit “Total Maniac”. This is one of their best songs ever, total classic and one of that kind that pushes you to start visiting more often the cemeteries by night. What to say, pure unholy and REAL Metal. The last four tracks stand very well but not as the previous and again I felt tired when it was to hear their entire album (the same happened with their previous works). That of course does not mean anything special. As HELLHAMMER are in their grave for ages ago, this band was always a very good outlet for all these creatures of the night that wanted to hear something close. Their return gives us the impression that they are in perfect inspiration levels to provide us with new morbid tales. Do you dare to enter the grave?